Customers and profit – everyone who has a product or service to sell needs well qualified customers and profit and plenty of both. 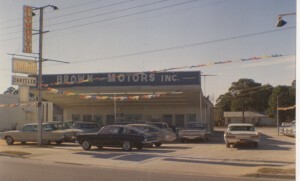 Very few people can argue with that as I discovered on a Chrysler Plymouth sand lot in Fort Walton Beach Florida in 1963-1965. Alex discovered the value of a single customer and their huge influence on the buying habits of others. He was not allowed to take ups, he was part time, he had to bring people in from Elgin AFB and the outside and sell them Chrysler Plymouth and used cars. 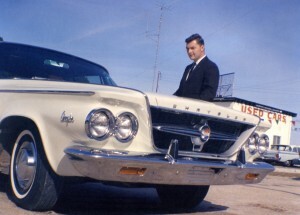 From that one customer, he sold and delivered 172 units in 14 months before the Air Force transferred him to SAC B-58’s. He outsold most of the full time staff as featured in a national Jackie B. Cooper magazine. Without a customer, you’re out of business! This hard truth has made me one of the highest paid highest achieving in career history. Your success as a sales person is limited only by you! The key to your success in sales is developing your own personal client base that sustains you with their referrals and client loyalty. Do not despair. Regardless of highly competitive markets, horribly depressed economies, brutal weather conditions, poor locations, a lack of inventory, marginal advertising, product image, dealer reputation, the web and social media, I have always excelled. 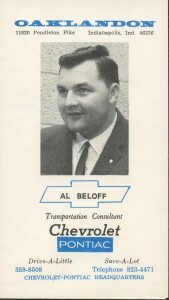 How did Alex deliver 28 new Chevrolets and Pontiacs in Indianapolis at Oaklandon Sales in a converted gas station surrounded by corn fields in the short month of February with snow up to the door handles, rusted cars, dead batteries and almost no floor traffic? How did Alex pocket several hundred dollars a week (that’s a lot of money in 1968) at the same facility selling an upgraded set of Jetson tires on new models? He will show you how to attract customers and profit.